Our Moon has a unique relationship to Earth. As the Moon orbits, it spins on its axis at the same rate that it goes around the Earth. Because of this, we on Earth always see the same side of the Moon, and never see the other! In fact, it wasn’t until 1959, when the Soviet “Luna 3” satellite was sent to orbit the Moon and send back pictures, that mankind had its first glimpse of the lunar far side. Left: If the Moon orbited the Earth, but didn't rotate on its axis, then all faces of the Moon would be visible to Earth over the course of its orbit. Right: Because the Moon rotates in the direction of its orbit, and at the same rate (e.g. one quarter rotation per quarter of orbit), the same side of the Moon is always facing Earth. This relationship doesn’t just affect the scenery here on Earth; it also means that the Moon’s far side is a very different place than the side visible to us, one which can provide a unique vantage point to peer deep into the galaxy, and deep into the history of our Solar system. The side of the Moon which faces Earth is a noisy place! It is constantly being bombarded by the natural and artificial radio noise being emitted from our planet, and by radio frequencies from the Sun for two out of every four weeks (half of the lunar “day”). The same way the constant light pollution of a big city makes it impossible to see all but the brightest stars, this “radio pollution” drowns out the very low frequency radio emissions which reach the Earth-Moon neighborhood from places in our Solar system, galaxy, and super-galactic system.1An added obstacle on Earth is that our atmosphere blocks out certain low-energy frequencies of the electromagnetic spectrum, so most of the very-low frequency radio waves never even reach Earth’s surface. The Moon’s far side, however, while it still has its two weeks of “daylight,” is always facing away from Earth, and is constantly shielded from Earth’s radio noise pollution. For this reason, it is possible to observe the universe in very low radio frequencies from the lunar far side—observations which are simply impossible from Earth, Earth orbit, or any other readily-accessible location. We have never observed the sky in these very long wavelengths, and having the opportunity to do so from an observatory on the far side of the Moon will provide a new, unexplored window into all kinds of processes, from the activity of our own system’s planets and star, to other stars and their planets, to our Galaxy, and to other galactic systems beyond. This will shed light on known unknowns and also currently-unknown unknowns, as investigations into unexplored regions of the electromagnetic spectrum have almost always resulted in complete surprises. Another important difference is that the shielding of the far side from other Earth-based phenomena, such as our magnetosphere, may mean that the solar wind was able to deposit higher concentrations of helium-3, a powerful fusion fuel, in its regolith. Only sample returns from the far side—something which may be included in the final phase of the current Chinese Lunar Exploration Program—will begin to shed light on this question. The far side of the Moon also promises to shed light on, and possibly challenge our ideas about our own planet’s history, as well as the history of the formation of the Solar system. We know very, very little about the geology of the Moon, and even with the extensive photographs sent back from various orbiters, we have only explored 5% of the lunar surface with the six Apollo landings! That’s comparable to taking a few samples from the territory of North America, and trying to glean everything there is to know about the Earth! One area of particular interest for study in the lunar landscape is the South Pole-Aitkin basin, one of the largest craters in the Solar system, located on the lunar far side. In this area, geological layers which formed billions of years ago are exposed and are accessible to human and/or robotic study. The South Pole-Aitkin basin has long been a desired target of a far side landing,3Apollo 17 astronaut Harrison Schmitt lobbied for NASA to make a far side landing the goal of one of the later Apollo missions,—18, 19 or 20—missions which were ultimately, and irresponsibly canceled under the Nixon administration. and many speculate that this is where China will aim their 2018 Chang’e 4 lander. 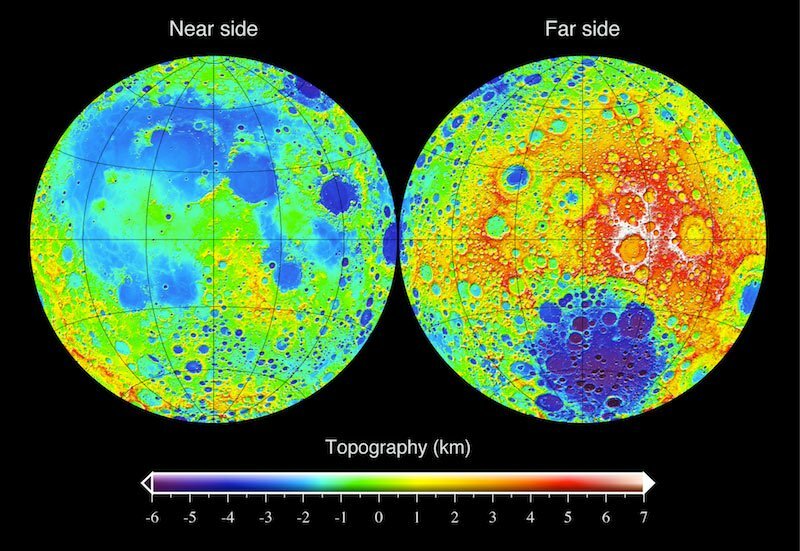 In this false-color topographic map of the Moon, the South Pole-Aitkin basin is clearly visible on the far side. The far side has other unique geographical features, which distinguish it from the near side, such as an almost total absence of maria, or “seas” (the dark patches seen covering the near side), which are created by volcanic floods. It is unknown why the far side has a near-complete absence of such recent volcanic activity. In these beautiful high-resolution images from NASA's Lunar Reconnaissance Orbiter, the dark patches which cover the near side (left), created by volcanic floods, are nearly absent on the near side (right). Exploring the Moon and pursuing these enticing anomalies will give us insight not just into the Moon, but into the history of our entire Solar System, its experiences in the Galaxy, and the history of the Galaxy itself. It is remarkable how much has been learned from just a handful of samples returned from the Moon, 40 years ago, and by using the more advanced instrumentation of today to further explore the many other diverse areas of the Moon—deep craters, lava tubes, recent volcanic formations, old formations, etc.—we can ensure the Moon begins to tell us its secrets, providing critical clues to understanding the undiscovered principles governing the organization of our Galaxy, other galactic systems, and processes beyond. What percent of the Moon’s surface has been explored by the 6 manned Apollo landings? Correct! 5%! (The territory covered by Armstrong and Aldrin on the Apollo 11 landing can fit within a standard soccer field!) What more will we discover with a robust presence of man on the Moon? By Benjamin DenistonA more detailed look at some of the known anomalies of the lunar far side, and what new windows into the processes of our Solar system and galaxy the Moon is waiting to provide us. By William Jones & Marsha FreemanA brief background to China's announcement of plans for a 2018 landing on the lunar far side with its Chang'e 4 mission. By Benjamin DenistonA class series on the Galaxy as mankind's next scientific frontier, situated from the standpoint of Johannes Kepler, Vladimir Vernadsky and Lyndon LaRouche. For more background, see "Towards a Galactic Science Driver".